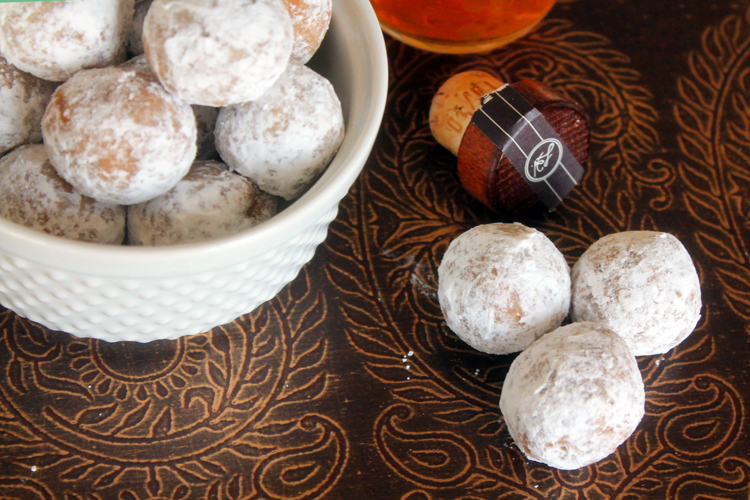 Maple Bourbon Balls really pack a punch. They’re fantastic little bites of bliss, great for serving at your next party, shower, or barbecue! Do you know what I love about being Southern? We can party. It may seem like we’re all proper and mannerly, but when it comes to celebrating, I personally think the South is where it’s at. 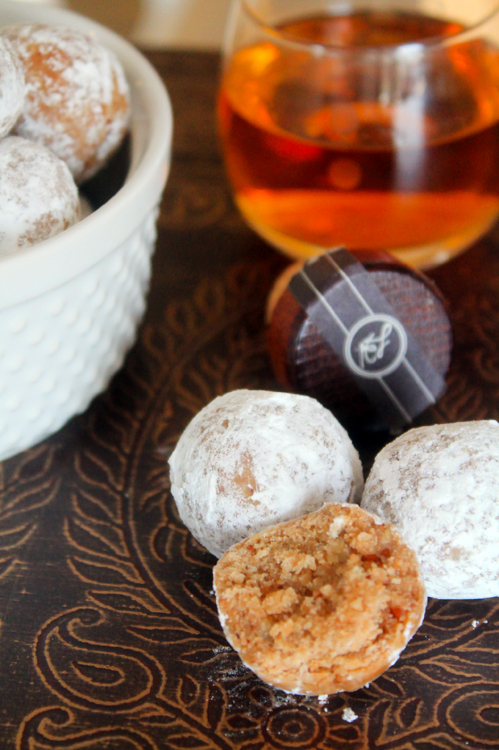 Take these Maple Bourbon Balls. Many a Southern woman is a complete teetotaler – never a cocktail to be had (though not this woman). Cookies with a little extra “oomph”, though? That’ll strike just the right tone for celebrating a new bride, without being too naughty for an afternoon bridal shower. I told you we know how to party. My sweet, sweet friend, Stephie, is getting married here shortly, so today a bunch of us are ready to virtually party on her behalf. Any excuse for bourbon balls, I tell ya. I’ve known Stephie for a couple of years now, as she was one of the first contributors to the other site I run, Food Fanatic. I adored her online, and then last year, we got to hang out at a food conference together. Not only did she kindly hold my baby whenever I asked, she made me laugh and laugh at every opportunity. Charming, funny, and just as sweet in person as she is online, that’s our Stephie. I’ve also gotten to know Stephie’s Momma, affectionately known as “Momma Swope” among many food bloggers. She’s incredibly supportive of all our work, and though I’ve never met her in person, I’d just love to give her a hug some day. I know she’s so super excited for her baby girl getting married, and I’m pretty sure she’s gonna be as excited by this surprise online virtual shower as Stephie. On your wedding day, make sure to pause, take a breath, and take in everything around you. Ten years from now, these are the only moments you’ll remember with any clarity. Nothing worth having comes easy, and that includes “Happily Ever After”. Choose, each day, to love Alex, and be in love with Alex. It is very much a choice, and choosing that happiness for yourself and him every day is a way to ensure a long, happy marriage. Even when the day is hard, finding a way to remind yourself of the happy moments will make for a better relationship. It’s hard to be mad at a guy when you’re reminding yourself of that time he made a complete fool of himself just for you, and then you had an epic kiss.. know what I’m sayin’? So let’s sit back, and nibble on these amazing Maple Bourbon Balls, and talk about all the ways that being married is awesome. Especially when it’s to your best friend. 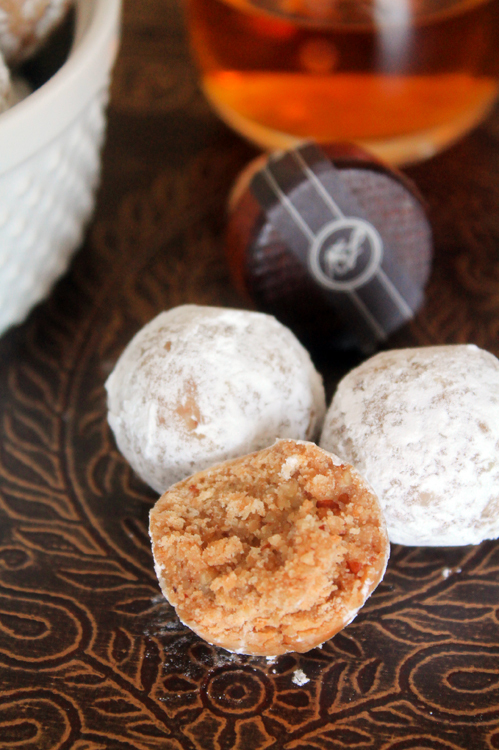 I made these cookie balls a little differently than most recipes. For one, they’re not chocolate. For two, I skipped the corn syrup and went for maple. For three, I decided just plain ‘Nilla wafers weren’t good enough to be truly celebratory. But Pepperidge Farm Bordeaux Cookies? Oh man. If you’ve never tried them, they’re these wafer-thin, caramelized sugar biscuits that are completely irresistible. They add a depth of flavor and additional crunch that I am SO in love with. Lastly, I used Angel’s Envy as the adult beverage of choice. Have you ever tried it? It’s a bourbon aged in Port wine barrels, and it is incredible. I’m not big on hard liquor on its own, usually. But Angel’s Envy is incredibly smooth, and just a little bit sweet. You’re going to LOVE these things. 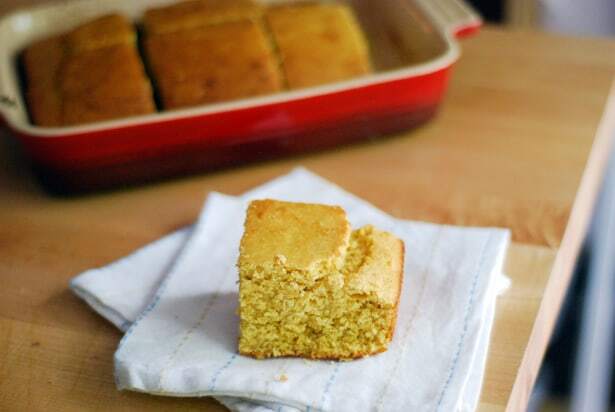 Serve them at your next party or barbecue if you don’t have any bridal showers coming up. Just make sure you label them adults-only, because they can pack a whallop! 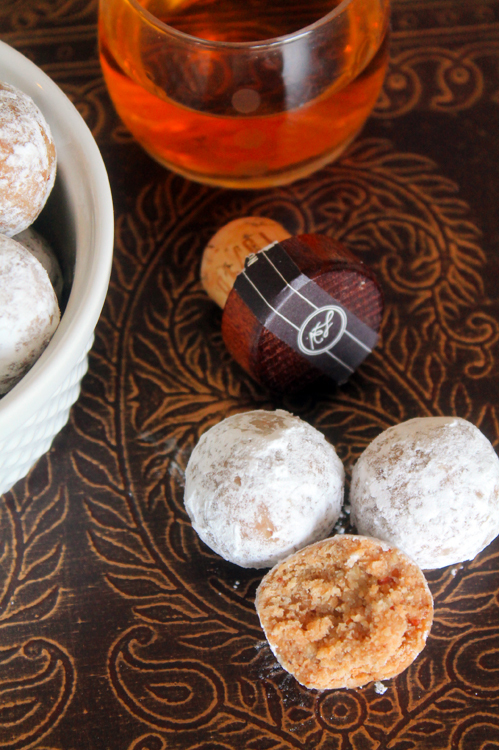 Maple Bourbon Balls are a true southern treat. They're no-bake too, making them an awesome quick treat! 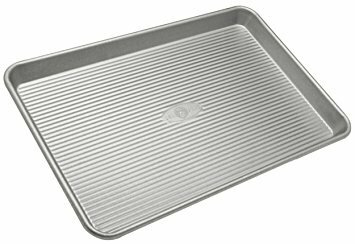 Line a jelly roll pan with wax paper or parchment paper. 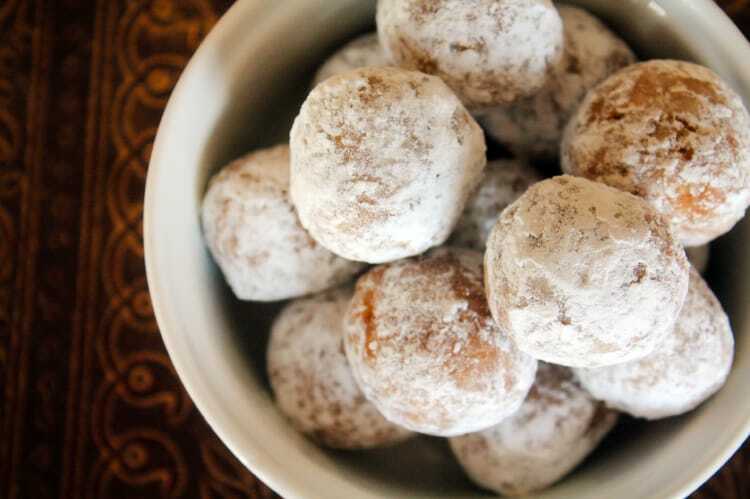 Pour 1/4 to 1/2 cup of powdered sugar for rolling into a bowl, and set both aside. Combine vanilla wafers, Bordeaux cookies, pecans, and powdered sugar together in a food processor and pulse until all cookies are well crushed, and ingredients well mixed. Combine maple syrup and bourbon together, mixing well. 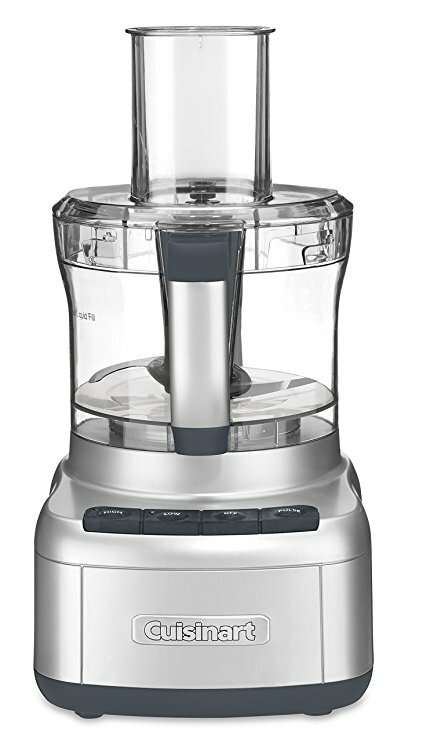 Add to the food processor and pulse again until combined into a moist dough. Use a small cookie scoop to scoop the dough into balls. 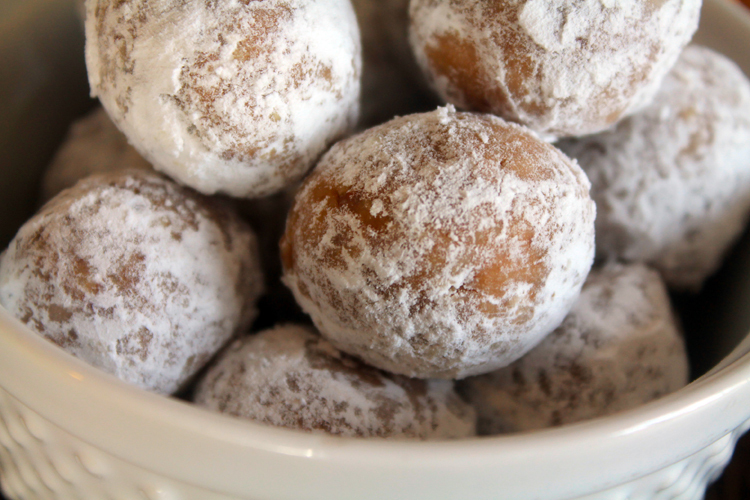 Roll in your hand to make round, and then roll in powdered sugar. Place in the refrigerator to firm up for at least an hour. Serve cool or at room temperature. Oh these are gorgeous and perfect for a wedding shower! Amber!!!!!! Oh you made me tear up, you sweet thing. Thank you so much for your sweet words and your lovely advice. My boss gave me the same advice about pausing and taking a few moments to take it all in. So wise! And this recipe. Hoooooney. First of all, Alex loves him some bourbon so, fab job there. Secondly, you’re so right – southerners are the best at party foods. My great grandmother’s boozy fruitcake is proof of that. Pour the booze in dessert, no need for a glass! Love you so. Xoxox. I have never met Mama Swope either but I cannot wait to meet her and I will hug her just the same as you would! It’s because of Stephie I started following your blog! She knows good people!! Awww I love this post! And the wedding advice 🙂 Stephie is THE BEST and these bourbon balls are the perfect way to celebrate!